When is a blockbuster not a blockbuster? We're about to find out this weekend as a CGI tech demo masquerading as a spectacular superhero film tries harder to make a thing out of something that's not a thing than anything has ever tried before. If we measured films by their Try Hard and ambition, Gods of Egypt would be well up there. Unfortunately for all involved, those two things don't make for a quality movie by themselves. 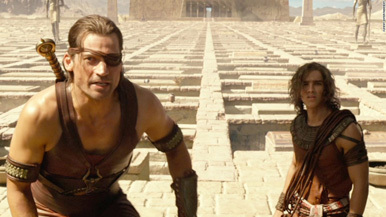 Directed by Alex Proyas, his first movie in seven years, it's a green-screened dumpster fire of a movie that attempts to build a mythology out of ancient Egyptian gods, Clash of the Titans-style. The problem comes, however, when the film tries to treat these characters as something we should already be familiar with and care about. It’s one thing to make some movie about Poseidon, Zeus, Hades and Hera, but it’s another to make one about Anat, Horus, Uthwin and Thoth (quick – which one of those is made up) and expect us to already have buy in. With its character posters (the most out of place since Armageddon made them so long ago and gave us a 40 foot tall visage of Steve Buscemi that I am still working on getting out of my nightmares), Gods of Egypt looks like nothing so much as an attempt to turn these historical gods into action figures and trading cards.